Neil Young’s long and storied career spans five decades, with success in groups like Buffalo Springfield, Crosby, Stills, Nash & Young, and his best-known work as a solo artist. He has received several Grammys with tons of nominations too, and the same goes for the Canadian Juno Awards. The Rock and Roll Hall of Fame inducted him in once as a solo artist in 1995 and again in 1997 for his work with Buffalo Springfield. Even still, in 2000, Rolling Stone magazine named him the 34th greatest rock ‘n roll artist of all time and #83 on their “100 Greatest Guitarists of all Time” list (later the list was updated and Young’s rank moving to #17. Rather than go into a long history of his career, which is varied and eclectic, I’d much rather focus on what makes Neil Young’s tone so interesting. He’s a fairly simple guy. Only choosing a few effects over the years, he prefers to rely on his amp tones for the bulk of his guitar sound. His favorite amp is his Fender Tweed Deluxe circa 1959. It is said that Young has collected over 450 different examples of this amp over the years but maintains that his original is the best-sounding and chooses to use this amp for every show from the late 1960s onwards. The amp is described as being an absolutely crucial component of Young’s sound, and is the defining hallmark of his electric guitar tone. The amp is stock except for a modification to convert it to accept 6L6 tubes, bumping the output up slightly from 15 to 19 watts. What is most interesting though, is the device that Young and his late amp tech Sal Trentino made: the Whizzer. The Whizzer was concocted in 1978 in order to accommodate Young’s desire to use various gain saturation levels on his Tweed Deluxe. The device physically turns his amp’s volume and tone knobs to one of four different settings that are controlled via a footswitch on stage. The first setting is a lower gain position that’s clean enough for Young to get good dynamic sensitivity based on how he picks. The second is even more distorted and is used for songs like “Hey Hey, My My,” and the third setting is a bit more distorted further. The final setting turns the master volume and tone to 12, and the other volume to around 9.9. The amp is said to be extremely sensitive and loses character at certain settings, so the sweet spot sits just between 9 and 10. This highly compressed and screaming tone is heard on classics like “Cortez the Killer” and many others. 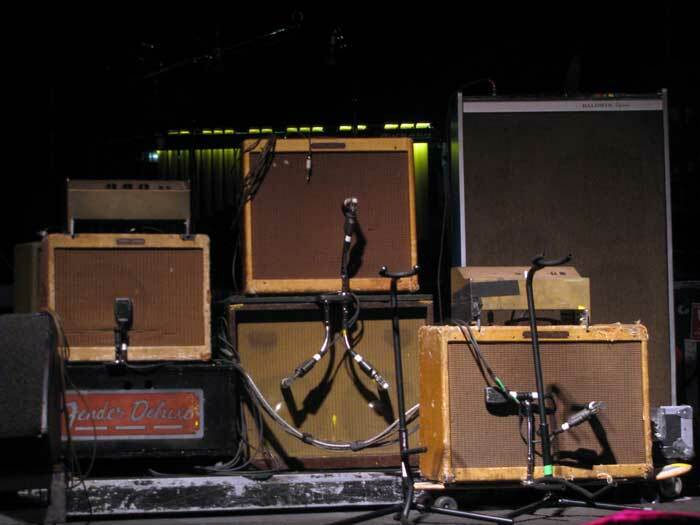 Young’s reverb is generated by an old Fender tank that is either positioned behind his wall of amps or underneath the stage depending on sound conditions. 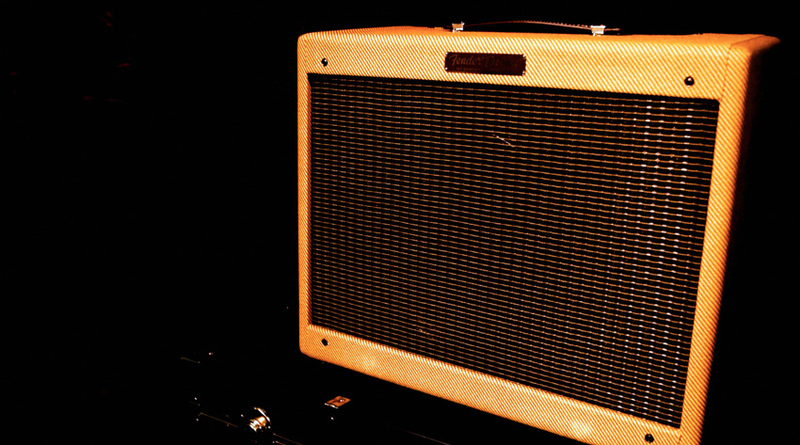 Though the Tweed Deluxe is his #1, Young uses a variety of other amps simultaneously to create his massive amp rig, and each serves a purpose. 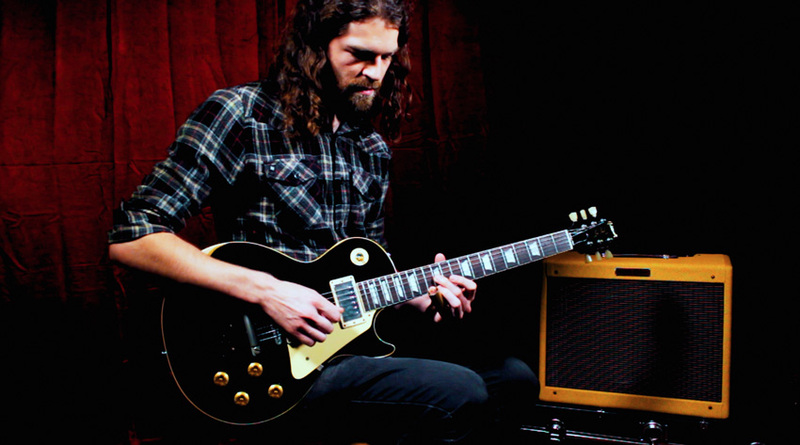 For instance, he sends the signal from his Deluxe out to an old 2×12 Magnatone 280 vibrato amp (made popular by Lonnie Mack). From there it goes to the real deal — the Baldwin Exterminator. The Exterminator is a huge amp made around 1971 and has two 15″, two 12″ and two 8″ speakers, all housed in the same cabinet. It has a sound that Neil specifically likes and so he uses it on stage for every performance. Interestingly, Young mixes his own levels on stage and prefers to hear mostly his Deluxe and a lot of the Baldwin with a little Magnatone, but out in the house speakers you hear mostly the Deluxe and the Magnatone. For effects, Young sometimes will use a Mutron octave divider pedal, a Boss Flanger unit, an Echoplex pedal, and a very old MXR analog delay pedal that is AC-powered. They are all housed in his pedalboard unit for easy switching on stage. Neil prefers to always control and operate all of his own effects himself. A dissection of Neil Young’s sound wouldn’t be complete without mention of his guitars, some of which are very well-known. One of those is his 1953 Gibson Les Paul Goldtop guitar nicknamed “Old Black.” Old Black got its name due to its black finish painted over the original gold top. This guitar would go on to be used on the majority of his music due to its unique sound. That sound comes from a few interesting features, all of which come together to create its own character. For starters, the original treble position pickup was replaced by a humbucker pickup from a Gibson Firebird guitar. It was incredibly microphonic and would create lots of noise and grit, which Young found particularly appropriate for his brand of rock guitar. A Bigsby vibrato tailpiece was added as well, because Young felt it was an inherently more expressive bridge and found other alternatives too “stiff.” He also appreciates the tuning instability it offers because of his belief that a guitar really shouldn’t always stay perfectly in tune, especially if it’s put through some abuse. Old Black also has a toggle switch that bypasses its pots and capacitors and sends the guitar signal directly out to the amps for max output. At this point, it truly is a legendary guitar, and he still performs on it regularly to this day. Young is a lifelong Martin user and consistently records and performs on them. 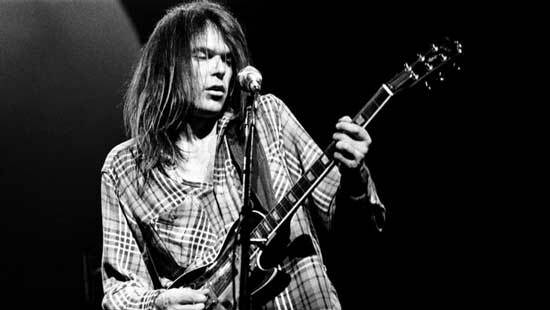 Many people only know Neil Young as the solo singer-songwriter with a dreadnought acoustic in hand, that’s how associated he is with their sound. Young usually performs on a Martin D-45 dreadnought that was given to him by former bandmate Steven Stills in 1969 after they completed their first full concert. For our video, we wanted to showcase both sides of Young’s playing – his more reserved acoustic side as well as his over-the-top, charged electric playing. We started the show with one of his most famous riffs, “Cinnamon Girl.” He had written the song when he was sick with the flu at his home in Topanga, California and had a 103-degree fever. The song is in a compelling tuning too, a double drop D tuning where the first and sixth strings are tuned down to D.
We used a Fender ’57 Tweed Deluxe amp and plugged in a Gibson Les Paul Custom “Painted Over” model guitar. Naturally, we cranked the amp just as Neil would have done to achieve monstrous crunch tones. The saturation level of the amp is easily controlled by the volume knobs, but is super sensitive. Because these amps are meant to be cranked, you get up to almost full volume by around 2-3 on the dial and any adjustments past that point simply add in more distortion. Gain is easily controlled via your guitar’s volume knob to taste. 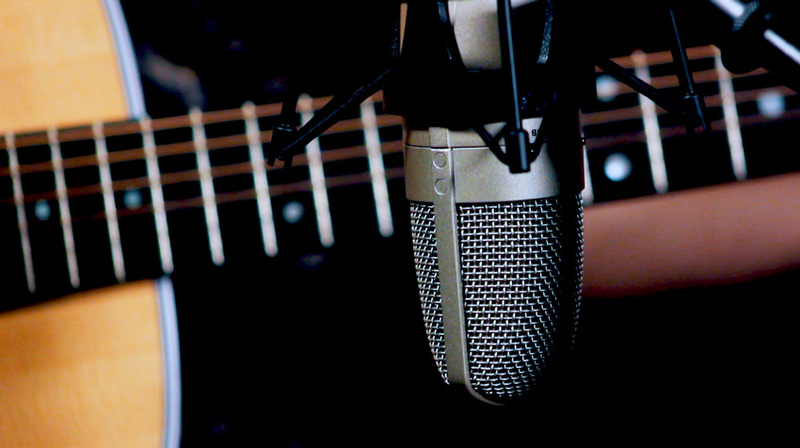 Next we wanted to tame things a bit and move to one of Young’s most famous acoustic tunes, “Old Man.” We grabbed the Martin D-28 dreadnought acoustic, and mic’d it up with a Shure KSM32. The guitar has a wonderfully full tone and sounded great multi-tracked too. We added in a few banjo parts that I played on the Martin as well as the main pedal steel track arranged for electric guitar. The next feature, “The Needle and the Damage Done,” turned out to be an excellent song to clearly showcase the sound of the Martin. After all, we didn’t record any vocals so the track ended up just being exclusively acoustic guitar. Throughout its dynamic range, it performed great and easily allowed us to capture a great acoustic tone for this sorrowful tune. Check out the video to hear the clear note separation and clarity the instrument provided for this song. We chose to end the video with “Rockin in the Free World,” a very well-known song that captures Young’s classic rock and roll playing to a T. We used our previous setup of the Les Paul with the Fender Tweed amp but wanted to use an alternative for those who don’t have a few thousand dollars to shell out for an expensive amp like that. The Catalinbread Formula No. 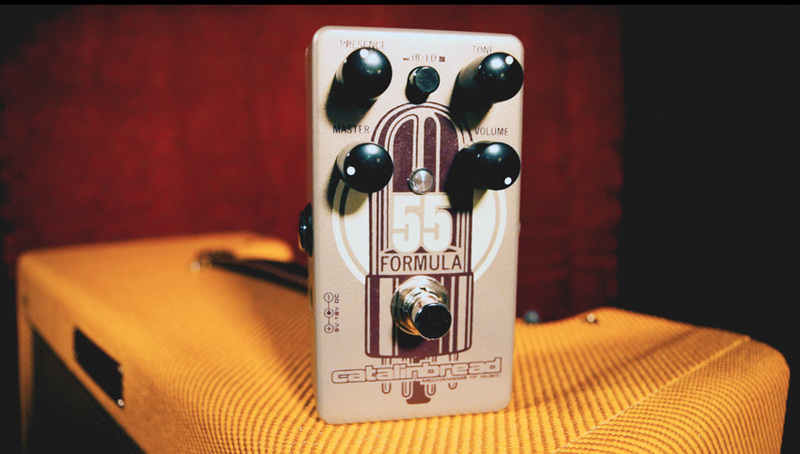 55 overdrive is a replica of the old Fender Tweed Deluxe amps and was perfect for adding to our signal chain to beef up our tone for the guitar solo. I did my best to replicate the general stylings of Young’s soloing and was happy with the results from the Formula 55 pedal. 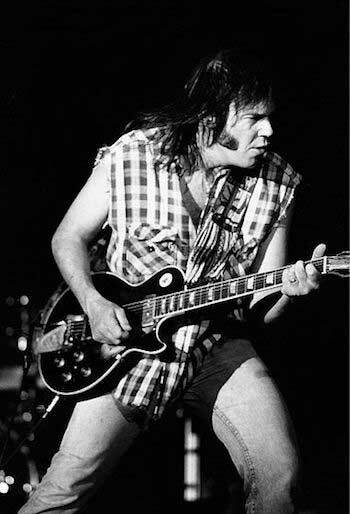 Neil Young certainly belongs among our Legends of Tone series, but his story is far from over. At 71 years old, he’s still going out and touring regularly and releasing music. His creativity and ability to reinvent himself have been a huge catalyst for continuing to propel his career forward, and it sure doesn’t look like there’s any end in sight. I think that an under-stated resource is Neil Young’s Gretsch stereo White Falcon. He’s played it since the CSN&Y days, and early-on, Crosby, Stills and Young all played Gretsches. The rumor is that “Old Black” was supposed to be a Gretsch Duo-Jet, but Young couldn’t get one, so he got the Les Paul, painted it black, and added the Bigsby to resemble the Jet. The rest is history. I concur, Walter and Justin. You’ve done an AMAZING job of just NAILING Neil’s tone, feel, and phrasing…. bravo! You must be a great guitar teacher! I always thought Neil Young’s sound on Hurricane was awesome. Any tips on how to achieve that sound? He gets that eerie sound and it is great! And thanks Justin, this is a great article! Hope you can recommend the gear used by other artists in the future also but this one on gear Neil Young uses is one I’ve been wanting to read and know for ages. Been listening to Neil since the sixties and always loved the sound(s) he created. He is one of my favorite artists if not my favorite!